The SAMA’s monthly roundup is BACK for February’s edition! 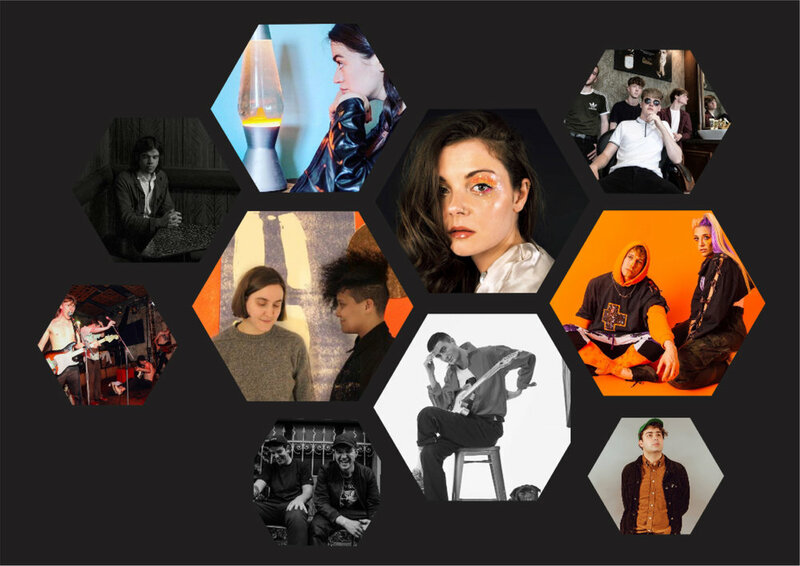 We’ve got you covered with new material from Honeyblood, Vukovi, and NEW artists such as Joesef and MORE! Click below to listen and subscribe. Evolving from a stay at a historic mansion in Arbroath, Andrew Wasylyk branched out to harp to give his third LP a distinct feel. Flight of the Cormorant is an explorative journey into the stunning musical landscape Wasylyk, otherwise known as Andrew Mitchell, creates through chilling harp flutters. Off the back of a sold out show at Glasgow’s Stereo with Sway, Gallus have been on the upward trajectory for a while. It is with a track like Looking Like A Mess, that their appeal is evident. The explosive energy they manage to fit into a song that’s under 3 minutes is astonishing. As well as a brief Ska moment, Looking Like A Mess is the basis for the quintet’s encroaching success. Leading the campaign ahead of Honeyblood’s third album, entitled “Plain Sight”, The Third Degree is as heartbreaking as it is scathing. A fuzz coated sweet with a bitter core the track bubbles with hooks as it progresses. Catch Honeyblood at this year’s Stag and Dagger festival. Coming from what seemed like nowhere, Joesef has already made his mark on the Scottish scene with a sold out show at King Tuts without a note of music released. A spectacular achievement, with the release of Limbo, the hype is totally justified. The tracks smooth neo-soul vibes have tapped into the trends as well as taking queues from older artists. Think a mix between Arctic Monkey’s and Al Green’s “Let’s Stay Together”. Packing a powerful pop hook to an instrumental that evokes early The 1975, Luna the Professor’s You is a fantastic debut from the Motherwell quartet. Coming off the back of selling out Glasgow’s King Tuts and Sneaky Pete’s in Edinburgh, the four-piece will no doubt be filling bigger venues in the near future. Edinburgh’s Man of Moon have been releasing a slew of singles since 2016 and have been lauded for their fusion of psychedelic rock. As part of their upcoming EP, Skin is a sultry track grounded by a booming bassline. Closing the track with a section of synth and bass riffs would fit perfect into a dark club or an arena-sized venue. Their first release since 2017, Sacred Paws have brought back their brand of afro-beat infused pop rock with elegance. Brush Your Hair is a stunning display of the two-piece’s ability to fill out their sound without the need for more members. With each instrument complementing one another, Rachel Aggs and Eilidh Rodgers lay down their soothing vocals. The short and sweet No Flags from Indie Rock collective Savage Mansion is the lead single from their brand new album Revision Ballads. Propelled by off-kilter guitars, its lo-fi vibes provide excellent background to the grainy vocal lines. Edinburgh based songwriter Siobhan Wilson returns with her first single of the year ‘Marry You’. The track is taken from upcoming LP The Departure which will be released on her own start-up label Suffering Fools Records on Friday 10 May. Glasgow’s pop-rock outfit Vukovi have returned from a brief hiatus with the thundering CLAUDIA. Taking their signature scuzzy riffs and embellishing them with glorious pop hooks, it is clear they have fine- tuned their craft in their time away. 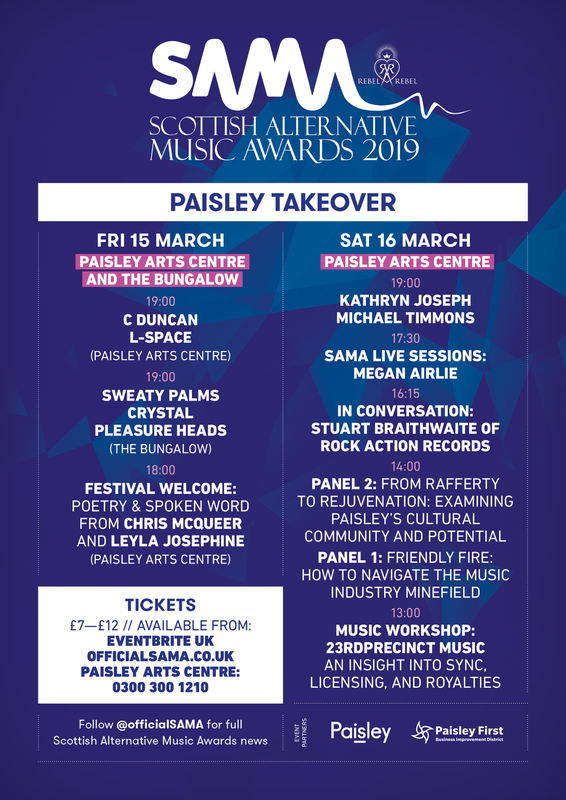 TWO WEEKS UNTIL PAISLEY TAKEOVER 2019.